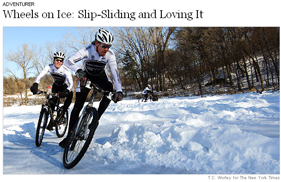 In today’s New York Times, I wrote about ice bike racing, a subgenre of the subgenre of winter cycling, which is a hybrid discipline where spiked tires bite solid ice on twisting, circuitous courses cut from a mantle of snow. 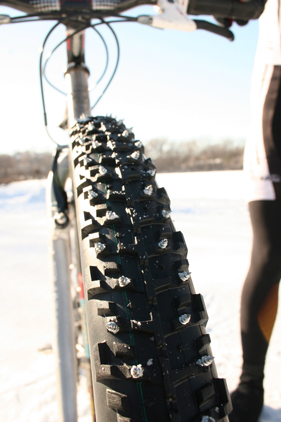 Like its cousin sport of ice motorcycling, ice bike racing appeals to a niche of hard-core winter riders, irreverent renegade types and cycling gear aficionados who thrill to toy endlessly with homemade spiked tires. 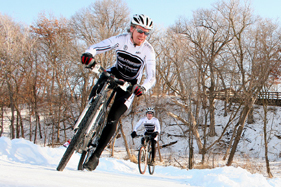 Nationally, there is no ice bike racing organization. The clubs that put on events are disparate and not in communication with one another. There are no rules or standards, making every race different. But an ever-increasing trickle of interest in wintertime riding has helped raise awareness of the events. 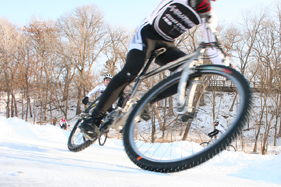 At competitions like the Chilly Chili Ice Race, held each January on a frozen lake in Bloomington, Minn., more than 100 riders regularly show up. “It’s a strange crew that does our race,” said Chuck Hood, a director of the Chilly Chili race. Several of my images from the session are below.